Every day 1,000 Europeans die from stroke - that's one every 90 seconds - and about twice that number survive but are disabled...Our estimates are that hypothermia might improve the outcome for more than 40,000 Europeans every year." This call does not come as a great surprise for me; when I was researching the role of animal research in the development of brain cooling to treat perinatal hypoxic-ischemic encephalopathy (HEI), a condition where a lack of oxygen and reduced blood supply during or shortly after birth causes brain damage, I found that all the papers I read cited animal studies of hypothermia to prevent damage in ischemic stroke. This is not surprising as in both conditions injury results from impaired blood supply. 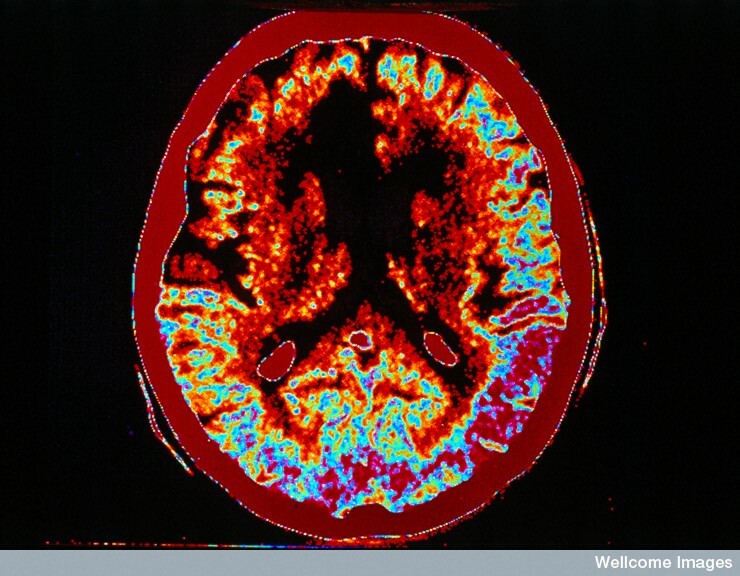 IMAGE: CT image of an ischemic stroke. The dark area in top left quadrant of brain shows the damaged brain area. Welcome Images. This is important, as anyone familiar with stroke research will recognize Dr Macleod and Dr van der Worp as fierce critics of inadequate design and reporting of some preclinical animal studies, and of mistakes made when designing clinical trials due to the misinterpretation and misapplication of the results of animal studies. Quite often they found that the design of clinical trials was so different to the design of the preclinical study that it was impossible to tell whether the failure of a treatment in human patients actually contradicted the earlier success in an animal model, both outcomes were entirely plausible even if you assumed that there was absolutely no fundamental biological difference between the effects of stroke in the animal model and in human patients. For example, one problem is that the majority of neurprotective drugs evaluaded in the past few decades were shown to be effective in animal models of stroke only when administered very soon after induction of stroke - usually after less than half an hour - whereas in clinical trials there were usually long delays - four hours or more- before initiation of treatment. The fact that hypothermia has a neuroprotective effect in animal models up to three hours after stroke onset will make design of a clinical trial that matches the conditions under which treatment was successful easier, though as with all stroke treatment the earlier it is started the better! It is notable that unlike animal rights campaigners who use deficiencies in some animal studies to call for a ban on it, Macleod and van der Worp understand its continuing importance to medical progress, and have worked with animal researchers to improve both the design and reporting of the preclinical animal studies that underpin the decisions to initiate clinical trials. Initiatives such as the ARRIVE guidelines are similar in many ways to recent improvements the design of clinical trials supported by the work of the Cochrane collaboration, and the widespread adoption of standards for the reporting of clinical trials. So the animal evidence supporting the clinical initiation of trials of hypothermia for ischemic stroke had to satisfy a very strict panel of judges, we hope that funding is provided to initiate these important trials in the very near future. Finally, and completely off topic, there was an interesting item in Nature news on the use of RNAi to attack block viral replication in a mouse model of HIV infection. It’s an interesting application of an exciting new technology that I have discussed several times on the Speaking of Research blog, indeed back in 2008 I covered the work of another group who are using a mouse model of HIV to aid development of RNAi based therapies for HIV infection. It is fascinating work, though as the Nature article stresses the technique needs to be refined, re-evaluated and improved a lot in animal models before it can be tried out in clinical trials of HIV patients. I expect that Drs Macleod and van der Worp would agree with that sentiment.